You will find below the horoscope of Jessica Lundy with her interactive chart, an excerpt of her astrological portrait and her planetary dominants. If you know the time of birth of Jessica Lundy, we would appreciate it if you would send us your information with your source, at stars@astrotheme.com. To thank you for contributing to the enhancement of our astrological database, we shall be glad to send you the astrological portrait (34 pages) of this celebrity. Horoscopes having the same aspect Jupiter square Saturn (orb 1°57'): Harper Lee, Aldo Maccione, Barbara Pompili, Flavio Insinna... Find all the celebrities having this aspect. Horoscopes having the same aspect Moon opposite Pluto (orb 2°06'): John Lennon, Helena Blavatsky, Tyra Banks, Pink (singer), Taylor Lautner, Gia Carangi, Amber Rose, Billie Joe Armstrong, Voltaire, Nina Simone, Neil Young, Lisa Marie Presley... Find all the celebrities having this aspect. Celebrities clicked on in real-time: 577,161,791 times. Here are some character traits from Jessica Lundy's birth chart. This description is far from being comprehensive but it can shed light on his/her personality, which is still interesting for professional astrologers or astrology lovers. 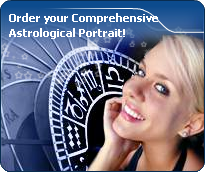 In a matter of minutes, you can get at your email address your astrological portrait (approximately 32 pages), a much more comprehensive report than this portrait of Jessica Lundy. Warning: when the birth time is unknown, which is the case for Jessica Lundy, a few paragraphs become irrelevant; distributions in hemispheres and quadrants are meaningless, so are dominant houses and houses' accentuations. Therefore, some chapters are removed from this part. The predominance of Water signs indicates high sensitivity and elevation through feelings, Jessica Lundy. Your heart and your emotions are your driving forces, and you can't do anything on Earth if you don't feel a strong affective charge (as a matter of fact, the word "feeling" is essential in your psychology). You need to love in order to understand, and to feel in order to take action, to the detriment of a certain vulnerability against which you should learn to fight. Jessica Lundy, Fire is dominant in your natal chart and endows you with intuition, energy, courage, self-confidence, and enthusiasm! You are inclined to be passionate, you assert your willpower, you move forward, and come hell or high water, you achieve your dreams and your goals. The relative weakness of this element is the difficulty to step back or a kind of boldness that may prompt you to do foolish things. The Mutable mode is the most emphasized one in your natal chart, Jessica Lundy, which indicates a mobile character that is curious and thirsty for new experiences and evolution. You are lively and flexible, and you like to react quickly to solicitations, but don't confuse mobility with agitation, since this is the danger with this configuration - and with you, stagnation is out of the question. Security doesn't matter as long as you are not bored. You optimize, you change things, you change yourself... all this in a speedy way. After this paragraph about dominant planets, of Jessica Lundy, here are the character traits that you must read more carefully than the previous texts since they are very specific: the texts about dominant planets only give background information about the personality and remain quite general: they emphasize or, on the contrary, mitigate different particularities or facets of a personality. A human being is a complex whole and only bodies of texts can attempt to successfully figure out all the finer points. Your sensitivity is all on edge, Jessica Lundy, and your emotions so deep, your imagination, so lively, that you are often found in the sweet realm of dreams. You create your own fantastical world with entangled fragments of current reality, romantic souvenirs and hidden hopes. Your receptiveness is so intense that it may border on mediumship or, more disturbing and rare, you may have hallucinations. Your character fluctuates according to the stimulation of the moment but in general, you are a nice person, full of gentleness and romanticism, always ready to understand and to dedicate yourself. You have real healing powers, would it be only through your ability to instinctively understand other people's sufferings. Your affective structures can be likened to a roving radar. You are vulnerable, hurt by the slightest aggression and easily influenced because you are unable to step back from people and events; therefore, you may start to be doubtful and lose the self-confidence that you so badly need to progress. In love, you are more cerebral and friendly than really passionate, Jessica Lundy. You are made for amorous friendships, for refined and light feelings where each partner retains one's freedom, and almost detachment, without getting really committed. Sometimes, you may be distant from, and indifferent to, love matters for a while, because you can be completely engrossed in original intellectual pursuits and the collective atmosphere which you are so fond of. You substitute a great number of friendly and light contacts to amorous relationships and it is fair to say that they satisfy you. To fall in love, you need spice and a partner who is original, who amazes you and whom you admire; under such conditions, you can freely express your feelings in an ambiance devoid of constraint, where freedom is perfectly respected and shared within the couple. Impulsive, impatient, quick and energetic? You? Yes of course, Jessica Lundy. You are courageous and able to make intense and huge efforts for a short while; and what a terrific rhythm! In sport, of course, or in your sexuality, you are not the type who ponders, you take action instinctively, “in a rough and ready way”. You are outspoken, you do not worry about other people's opinion and you do not allow them to slow you down or to judge you. You must succeed or fall apart. You cannot be bothered with diplomacy or with compromises. You are too straightforward and unyielding to waste time with finesse or shrewdness. This is what makes you charming because, with you, one always knows where one stands. This text is only an excerpt from of Jessica Lundy's portrait. We hope that it will arouse your curiosity, and that it will prompt you to deepen your knowledge of astrology, as well as to visit and use the wide range of free applications at www.astrotheme.com. Your Life Path is influenced par the number 9, Jessica, the path of travel and transcendence. You know how to take a new look at yourself and how to broaden your horizon. You are driven by the thirst for achievements and you cultivate the sense of the sacred and of sacrifice. Life teaches you to constantly push further the limits of your ego. Your destiny is based on altruism and devotion. You are very generous and you always listen to people's needs, which is among the reasons why you are very much sought after. You also show little interest in socializing or social futilities. Your spiritual growth means much more than worldly frivolities, even though it means that you have a hard time remaining grounded when you experience difficult circumstances! Your Life Path prompts you to learn, to increase the number of enriching experiences, and to constantly progress. You are interested in intellectual matters, and you set yourself high objectives. Meditation and contemplation are your valuable assets.